Kaminer Haislip is participating in the annual Night of 1000 Lights in historic downtown Aiken, SC on Thursday, December 6 from 6-8pm. Sponsoring businesses will stay open late, thousands of gorgeous luminaries will line the streets of downtown Aiken, and there will be wide variety of fun holiday activities taking place. This exciting event, organized by the Aiken Downtown Development Association, is a tradition not to be missed! During the event, Kaminer’s handcrafted silver jewelry, functional objects, and Christmas ornaments will be displayed for sale at her family’s business, True Value Hardware & Appliance, located at 121 Laurens Street. 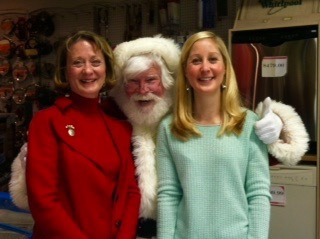 Stop by True Value to see her work and enjoy some holiday cheer! 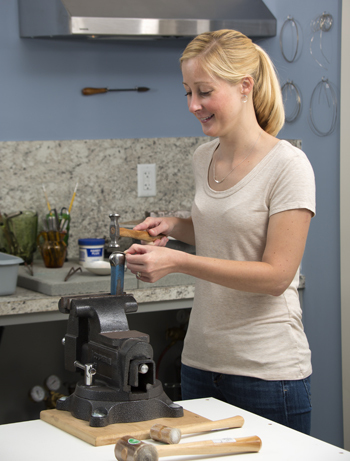 “How did you get into silversmithing?” is one of the most frequently asked questions I receive. I discuss it briefly in my Bio posted on my website, but I get the same question so often I decided to share more of my story on my Blog. Aiken, South Carolina, which received Southern Living’s 2018 award for The South’s Best Small Town, is my hometown. 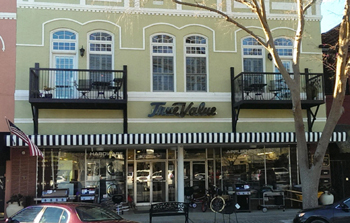 I grew up in my family’s business True Value Hardware & Appliance, which is located on the main street of Aiken’s historic downtown. 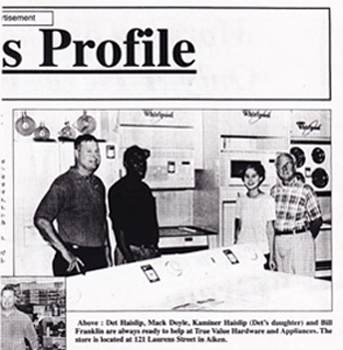 My grandfather Bill Franklin started the hardware store as a side project when he was an accountant at Savannah River Site. When my parents Det and Lyanne Haislip were married, my father took over the business. As children, my brother Wylie, cousins Anne and Franklin, and I spent a lot of time there, especially at Christmas. 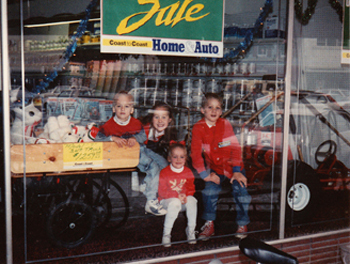 As you can see in the picture below, we had so much fun with the toys, go carts, and window displays! In high school, I worked in the hardware store and that is when my interest began in making sculpture and jewelry. Being around all of the tools and equipment, putting together bikes and toys, and cutting keys is now an obvious connection to how working with my hands became my career. When I was in high school, I took the industrial tech class, because I wanted to learn how to make sculptures in metal and wood. Being the only girl in the class did not bother me at all and I took to learning welding and wood working immediately. One of my first wood sculptures is shown below. 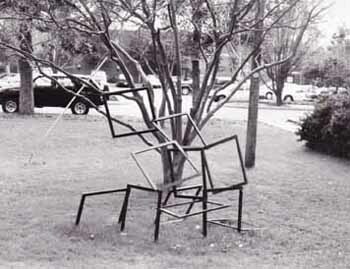 Displayed in a downtown Aiken park not far from my family’s business, it was my first artwork exhibited outside of a school setting. I knew by then I wanted to be a professional artist and major in jewelry and sculpture in college, so I sought out a college with a strong jewelry and sculpture program. After careful deliberation, I decided the small liberal arts college Winthrop University in Rock Hill, SC would be the best fit for me. Alfred Ward, an English silversmith from London, was head of the jewelry and metals program and I was excited to study under such a renowned silversmith. 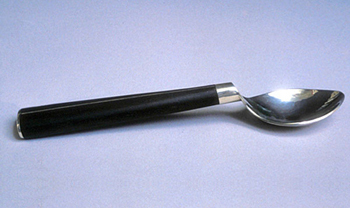 The first functional silver object I made studying under Alf was the silver spoon with ebony wood handle shown above. This piece is significant to my work, because it was the first time I laminated silver and wood. I continue to use this method of fabrication for spoon, teapot and coffeepot handles, because it creates strength in the handle and a beautiful line of silver down the center. From there I was hooked on silversmithing, because it combined my interest in jewelry techniques and sculptural forms. 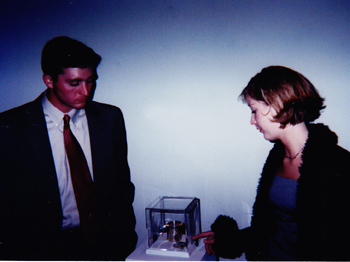 My graduation exhibition with my classmates in Charlotte, NC was my first commercial art gallery exhibit. Pictured above is me with my brother Wylie looking at one of my display cases at the opening reception. After graduating with my BFA in Jewelry and Metals, I moved to Charlotte and started my MFA silversmithing studies under Alf at Winthrop. While in graduate school, I focused on silversmithing and immersed myself in it completely. During that time, I also taught the Jewelry II and III classes and jewelry workshops at Winthrop. Additionally, I interned and was a docent at the Mint Museum, where I learned up close the history of craft and design and how a professional institution operates. During the summer of 2004, I went to London for a family trip and my MFA thesis research. Alf and his wife were in England visiting family, so he was kind enough to meet us in London and show us around. 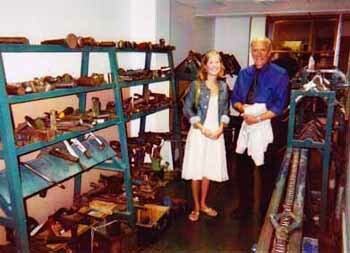 Pictured above is me with Alf in the stake room of Sir John Cass London Metropolitan University, where Alf was formerly head of the silversmithing and jewelry department. In 2005 I graduated with my MFA in Silversmithing and Design with a minor in Sculpture. 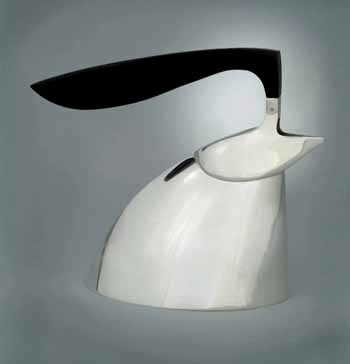 The first teapot I made was Perched Flight and it is silver with an ebony wood handle that is laminated with silver in the center. It was the central piece to my MFA thesis exhibition and after was accepted to five national exhibitions and one international exhibition. I became very attached to it, so it is now in me and my husband’s collection. 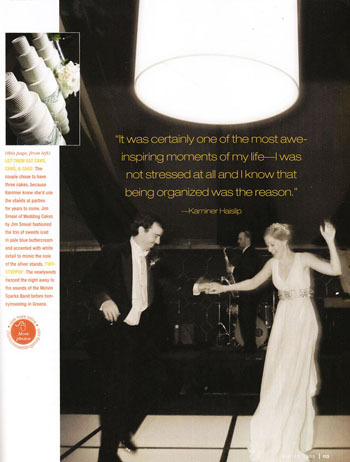 Immediately following graduation, I moved to Charleston, South Carolina and established my studio and business. Three years later my husband Matt and I had our wedding reception at the William Aiken House. My hometown was named for William Aiken and his father is my great-great-great-great uncle. My path to silversmithing began at a very young age, but it wasn’t until I started my business and began exhibiting my work nationally that people started asking me “How did you get into silversmithing?”. When I thought about it and shared my story, I realized how unusual it is for a girl to grow up in a small southern town hardware store and become a contemporary silversmith. Really?! For less lengthy answers to frequently asked questions, visit my FAQ page on my website! https://www.kaminerhaislip.com/wp-content/uploads/2017/11/logo-silver-jewelry-kaminer-haislip-340x156.jpg 0 0 admin https://www.kaminerhaislip.com/wp-content/uploads/2017/11/logo-silver-jewelry-kaminer-haislip-340x156.jpg admin2018-03-20 22:40:172018-03-22 16:56:40"How did you get into silversmithing?" Thank you so much Matt Kaufax for featuring me on News Channel 12 for Aiken Kicks Off Night of 1000 Lights! 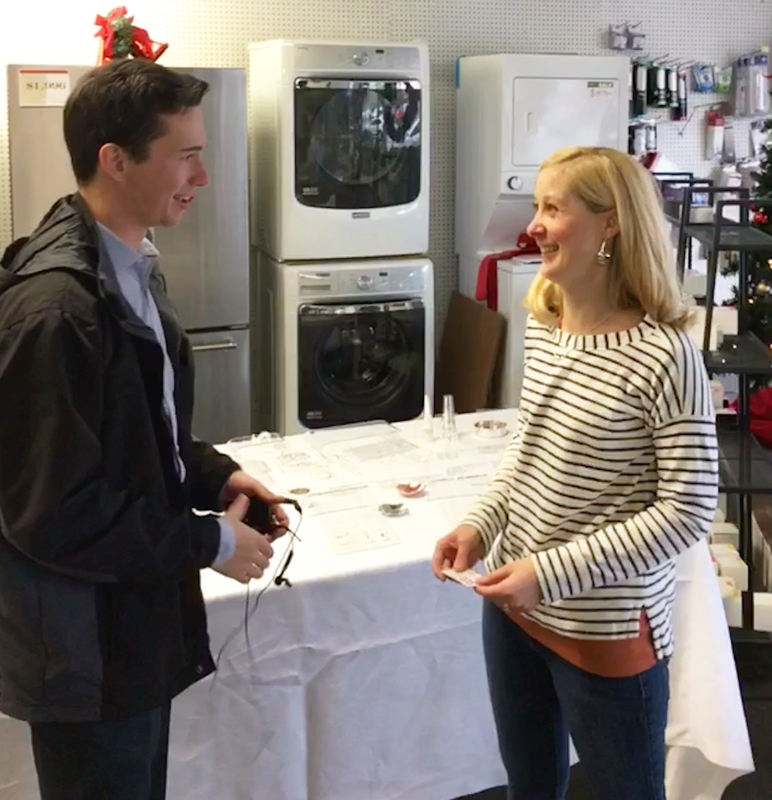 My trunk show was held during the event at my family’s business True Value Hardware & Appliance in downtown Aiken, SC on December 7, 2017. It was great to see old friends and meet new ones despite the rainy weather! Watch the feature at the link below! The Aiken Downtown Development Association has organized the Night of 1000 Lights in historic downtown Aiken, SC. The event will be held on Thursday, December 8 from 6-8pm. Sponsoring businesses will stay open late, thousands of gorgeous luminaries will line the streets of downtown Aiken, and there will be wide variety of fun holiday activities taking place! During the event, Kaminer Haislip will be exhibiting for sale her hand crafted silver jewelry and objects at her family’s business, True Value Hardware and Appliance, located at 121 Laurens Street. Stop by True Value to see her work and enjoy light refreshments! The Aiken Downtown Development Association, City of Aiken Arts Commission, City of Aiken Parks, Recreation & Tourism Department, and Aiken Artist’s Guild are sponsoring the 2016 Horses & Courses Art Walk in historic downtown Aiken, SC during the week of the famed golf tournament The Masters held in nearby Augusta, GA. The event will be held on Tuesday, April 5th from 5-8pm. The Aiken Downtown Development Association Member Businesses have been partnered with an artist and their work will be on display in that business the night of the event. During the event, Kaminer Haislip will be exhibiting her hand crafted silver jewelry and objects for sale at her family’s business, True Value Hardware and Appliance, located at 121 Laurens Street. Stop by True Value to see her work and enjoy light refreshments! The Aiken Downtown Development Association, The City of Aiken Arts Commission, and Aiken Artists’ Guild have organized the 2014 Horses and Courses Art Walk in historic downtown Aiken, SC during the week of the famed golf tournament The Masters held in nearby Augusta, GA. The event will be held on Tuesday, April 8th from 5-9pm. The Aiken Downtown Development Association Member Businesses have been partnered with an artist and their work will be on display in that business the night of the event. During the event, Kaminer Haislip will be exhibiting her hand crafted silver jewelry and objects at her family’s business, True Value Hardware and Appliance, located at 121 Laurens Street. Stop by True Value to see her work and enjoy light refreshments!